If you were God, writing a book you wanted men to understand, would you write it in such a way that men would have to make up meaning in order to understand it, or would you write it in such a way that those that seek to understand could actually come to a knowledge of its truth (Mt 7:7)? The present commentary takes the position that God wrote Revelation such that with sufficient effort and intellectual honesty, readers can understand it. Certainly God uses symbols in Revelation, but when He does, He provides inspired interpretations of the symbols. This commentary seeks to avoid the mistakes of the views that use the symbolical approach to Revelation (preterist, continuous historical, spiritualist, and idealist). These approaches suffer from two basic flaws: assuming the text is symbolical when it is not and making up meaning regarding the text based on stream of consciousness word association, much as one would do looking at Rorschach inkblots. 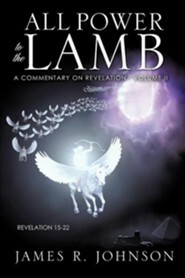 This commentary seeks to avoid telling God what He should have said and strives to understand what God actually meant.Of all the existing approaches to understanding Revelation, this commentary is most closely aligned with the dispensationalist (premillennialist/Left Behind) view in that it views Revelation from a literalist perspective. It is different from the typical dispensationalist schema in that it views the seven seals as the powers of the Lamb, understands the exercise of the powers of the seven seals to be simultaneous processes, and casts chapters 8-22 as three parallel prophecies of the Lamb's power over the course of the histories of Israel, the nations, and the saints. This commentary also makes use of many of the non-canonical works that provide insight into the spirit world and detail regarding the end of the present age. I'm the author/artist and I want to review All Power to the Lamb.